Hence the starting point now proposed is 2.57 times of what was prevailing on 01.01.2006. This fitment factor of 2.57 is being proposed to be applied uniformly for all employees. It includes a factor of 2.25 on account of DA neutralisation, assuming that the rate of Dearness Allowance would be 125 percent at the time of implementation of the new pay. Accordingly, the actual raise/fitment being recommended is 14.29 percent. 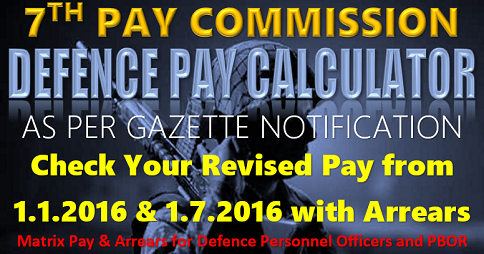 The fitment formula suggested by all the earlier Pay Commissions was not reflective of the actual revision of wages. The employees who were on rolls on the date of implementation of the Commission’s recommendation comparatively received lesser benefit than the new entrants. Amongst the existing employees also, more benefit accrued to persons with lesser service period. This happened due to the rejection of the demand of the Staff Side to have point to point fixation. The anomalous situation was addressed during the discussion the Staff Side had with the Group of Ministers in September 1997, over the implementation of the recommendations of the 5th CPC. 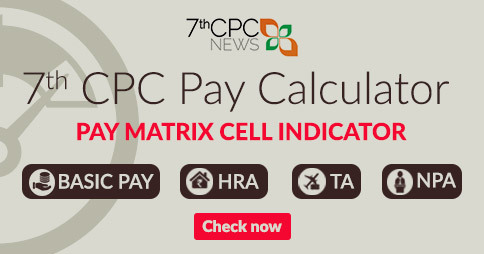 In the place of 20% of the basic pay recommended by the 5th CPC as fitment formula the Staff Side could negotiate and settle it at 40%. The said agreement brought about near total satisfaction over the revision benefit amongst all sections of employees. The said 40% benefit brought about uniform multiplication factor too. Taking these in to consideration, we suggest that the multiplication factor (26000/7000 = 3.7) may be applied uniformly in all the cases to arrive at the revised pay in the new scale of pay. I was released from Indian Air Force on 30/11/2011 as a Corporal with basic pay of Rs. 17270/- (including Grade Pay of Rs. 2400/-). 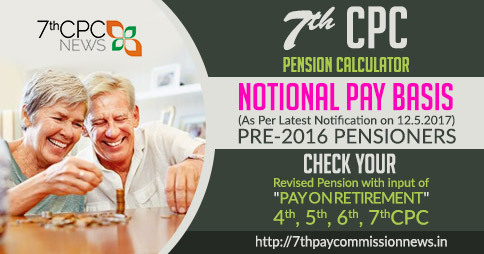 My new basic pension as per Seventh Pay Commission is Rs. 22385/- +DA-Rs.4355/-. I had joined as LDC in Patent Office coming in Department of Industrial Policy and Promotion under Ministry of Commerce and Industry. My basic pay was fixed at Rs.19900/- (Grade Pay of Rs. 1900/-) plus all other allowances admissible to Central Government Servants. Please educate whether my basic pay fixed is correct or not and also how it can be rectified? 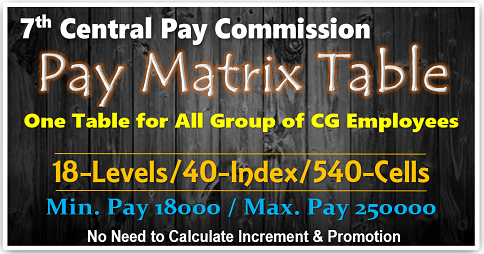 The basic pay of mts/group D 5200+grade pay 1800=7000 fitment 2.57=17990 new 7th pay commission salary fixed 18000/ basic but other category 5200+gp 1900/ fit ment 2.57 ? And 5200+2000gp =? 2.57 fitment =? 5200+2400gp =and 2 .57 fitment ,the fitment calculate 2.57 only low class employs , that see new pay scale .now group D post up grade group C category but no benefit to them. Expet group D employees fitment 2.57 and others is 3 and above .can see the two salery scales 6th and 7th chart. 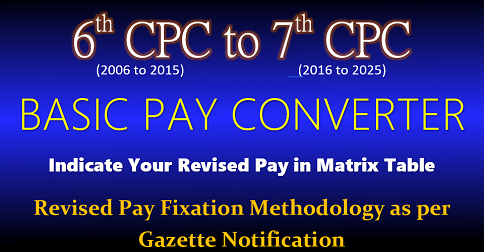 Sir, One thing I want know about the fitment factor of 7th Pay Commission. As per government policy, government wants to decrease parity gap between upper class employee and lower class employee but 7th pay commission recommended and sanctioned by government that upper class employee upgraded by 3.81 fitment factor of their basic salary whereas lower class employee upgraded by 2.57 fitment factor which is increase the gap of salary between the above mentioned employees. In view of the above explanation as per my view the Government do not want to decrease the gap between upper class employee and lower class employee otherwise Government should take action for the same. sir , at the time of implementation of 7 th cpc the DA was 125% it is converted in to 100 +125 =225. the increase in pay was 14.29%. 225*14.29%= 32..15.
why the allowances were deprived for the people who retired between Jany 2016 to June 2017. However the perks and allowances payable out of public money to politicians were doubled/tthre times, the multiplication factor was not uniform for all cadres. Replace the factor by 2.75 as mentioned in the recommendations. My basic on 1/1/16was 25610+6600(grade pay) then on 6/1/16i got an increment of family planning TT operation. Now if new basic is calculated on basic on 1/1/16 then where will my increment go. Should I add it after fixation in the new matrix. Please respond as I am not getting any guidelines regarding this matter from anywhere. Pay in pay band Rs. 23410 / Grade pay Rs. 5400 / scale of pay band 9300–34800. What will be my basic pay as on 01-01-2016. I was promoted as TGT in June 2006, now I have completed 10years in this grade. My present basic pay is 56900. What will be my new pay after implementing MACP. In July 2017. My date of retirement is 31.8.2003 with last Pay Drawn Rs.7900/- in the Scale of Pay Rs.6500-200-10,500 [Gazetted Gr.B] ( 5th CPC) .My Basic Pension as on 01.01.2006 was fixed as Rs.8724/- & on 01.01.2016 on 7 CPC my Basic Pension was fixed on multification factor (2..57) as Rs.22,421/-. 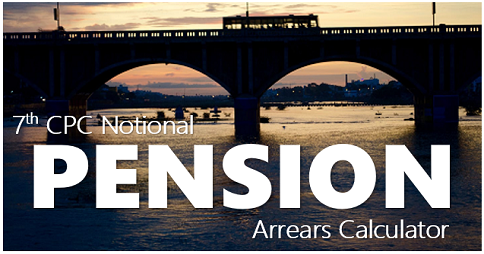 Kindly confirm my Basic Pension as per Min. 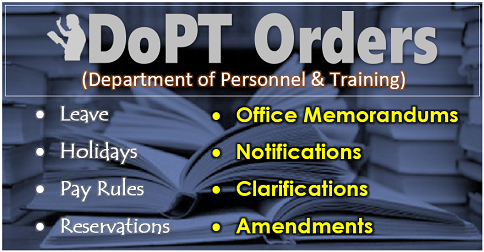 of Personnel, PG & P, DoP&PW Order dt. 12.5.2017. As per g..servants.com, the result on the basis of my aforesaid data, my revised pension payable has been reckoned as Rs.24,500/-.Kindly confirm whether the amount is correct. If not, the correct position with mode of fixation may kindly be intimated.